Wilhelm Tell is powered by Yggdrasil Gaming and has 5 reels and 20 paylines. Playable from 10p to £50 per spin across all devices, this game is based on the legendary Swiss expert marksman. It comes with 3-high wilds, wild nudges if they guarantee a win and 3 free spins features where you can get multipliers up to 50x. The first thing you’ll notice is the soundtrack – it uses Wilhelm Tell’s 1829 overture and provides a calming feel. Set in the Alp mountains, the reels are encased in a Swiss chalet – it looks rather good truth be told. Symbols on the reels include hearts, diamonds, clubs and spades (low value symbols) as well as 3 characters – you have a knight guard, Wilhelm Tell and Gessler the Tyrant. The latter is the most rewarding symbol giving you 7.5 times your stake for 5 across a payline. There’s a wild symbol – it’s a boy tied to a tree with an apple on his head (Wilhelm Tell’s son Walter). Wilds appear 3 symbols high and substitute for all symbols bar the scatter. Wilhelm Tell comes with a Wild Nudge feature – basically, wilds will nudge to fill the entire reel if they guarantee you a winning combination. It can appear on all 5 reels which helps. The only negative is that the free spin scatter doesn’t appear during the feature meaning you cannot retrigger the feature and win more free spins. Now, the Free Spins feature is where the bigger wins will come from – if you manage to fill the reels with wilds, you’ll win 150 times your stake. If you choose the 5x multiplier option, you can win 750 times your stake on each free spin. If you choose the 10x multiplier option, 1,500 times your stake is up for grabs on every free spin. If you opt for the 50x multiplier option, you can pocket 7,500 times your stake on your single free spin! Whilst 7,500 times your stake on that free spin sounds appealing, the chances of filling the reels with wilds and the highest value symbol are pretty slim, if at all. Variance wise I found Wilhelm Tell low to medium – it’s all about the 50x multiplier for the big payouts. You need patience and a lot of luck! 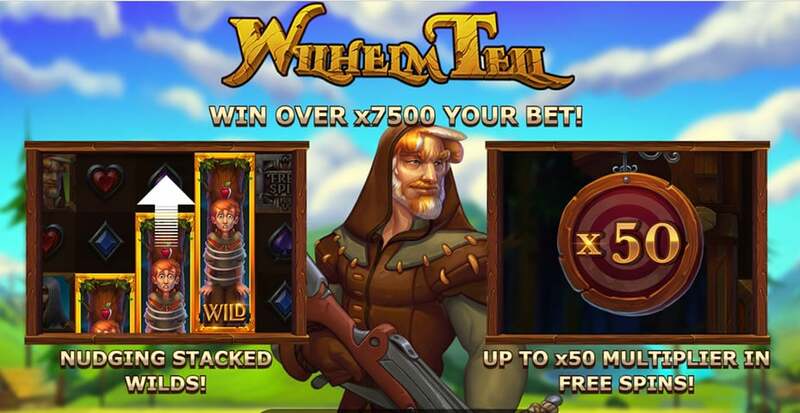 Wilhelm Tell is nicely designed and quite basic – I do prefer other Yggdrasil Gaming slots which offer more on the features front such as Dwarf Mine or Champions of Rome.